We all know we are a society addicted to our cellphones. But a recent study from TeleNav indicates just how far we would go rather than part with our beloved wireless technology. -Among other guilty pleasures, 55 percent of folks were willing to go without caffeine, 63 percent said they’d give up chocolate before their phone and 70 percent would forsake the drink to hang on to their phone. -54 percent of people were willing to go a week without exercise to keep a tight grip on to their phone. I wonder how many people were already going a week without exercise. I’m surprised that number isn’t higher than 54 percent. As far as the limits of how people would go, one and five were willing to even go shoeless. Perhaps a sign of just how much people love their iPhone, 43 percent were willing to go shoeless, as compared with 27 percent of Android users and a quarter of BlackBerry owners. Only 14 percent of feature phone owners felt similarly. I have to say, if you are willing to go without seeing your loved one than give up your non-smartphone, you might want to rethink both your relationship and your choice of technology. 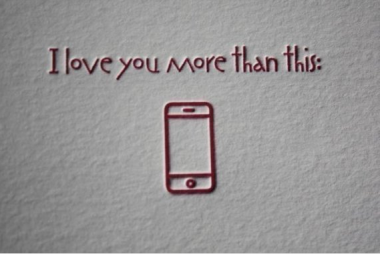 (Letterpress image courtesy of Elizabeth Weil)We all know we are a society addicted to our cellphones. This entry was posted on August 8, 2011 at 7:01 pm and is filed under Uncategorized. You can follow any responses to this entry through the RSS 2.0 feed. You can leave a response, or trackback from your own site.